Slovenia accused European Parliament president Antonio Tajani and Italy’s Interior Minister Matteo Salvini of historical revisionism Monday (11 February) over statements they made at a ceremony commemorating Italian victims of World War II massacres. Tajani and Salvini had spoken at the event on Sunday in Basovizza, near the Slovenian border, close to where many of the victims were killed by Tito’s Yugoslav partisans. Quella di domenica a Basovizza è una giornata che non scorderò. The victims were often thrown alive into deep sinkholes known as “foibe”. Salvini made a direct comparison between “the children who died at Auschwitz and the children who died at Basovizza”. “There are no first- or second-class martyrs,” he said. #Salvini su #Foibe: Non capisco perché il Premier sloveno abbia protestato per le mie parole, ma io non credo che un bambino morto per mano di un nazista sia diverso da uno morto per mano di un comunista. “I’m deeply concerned by inadmissible statements by senior Italian officials suggesting that the foibe (killings) represented ethnic cleansing,” Slovenian President Borut Pahor said in a letter sent on Monday to his Italian counterpart Sergio Mattarella. “It’s unprecedented historical revisionism. Fascism was a fact and its objective was destroying the Slovenian people,” Slovenian Prime Minister Marjan Sarec said in a tweet on Monday. V soboto sem govoril o želji po potvarjanju zgodovine v Sloveniji. Enako se dogaja na italijanski strani meje. Žal s strani vidnih politikov, celo EU funkcionarjev. Zgodovinski revizionizem brez primere. Fašizem je bil dejstvo in imel je za cilj uničenje slovenskega naroda. He ended his speech by saying “Long live Italian Istria, long live Italian Dalmatia”, referring to what had been Italian territories between the two world wars and which are today part of Slovenia and Croatia. Croatian Prime Minister Andrej Plenković, who is also a member of the European People’s Party, like Tajani, rang the Italian politician the same day to protest. “What he said was wrong and I told him that on the phone. I strongly condemn and reject his statement, which smacks of revisionism and territorial pretensions. The Croatian government and the HDZ strongly oppose that”. He explained that his reference to “Italian” Istria and Dalmatia “was in no way a territorial claim”. “I was referring to Istrian and Dalmatian Italian-speaking exiles, their children and grandchildren, many of whom were present at the ceremony,” he went on. The massacres have long been a source of contention between Italy and Slovenia. The two countries disagree on the total number of victims of the killings, with figures ranging from the hundreds to over 10,000. The memory of the killings has also been controversial within Italy. 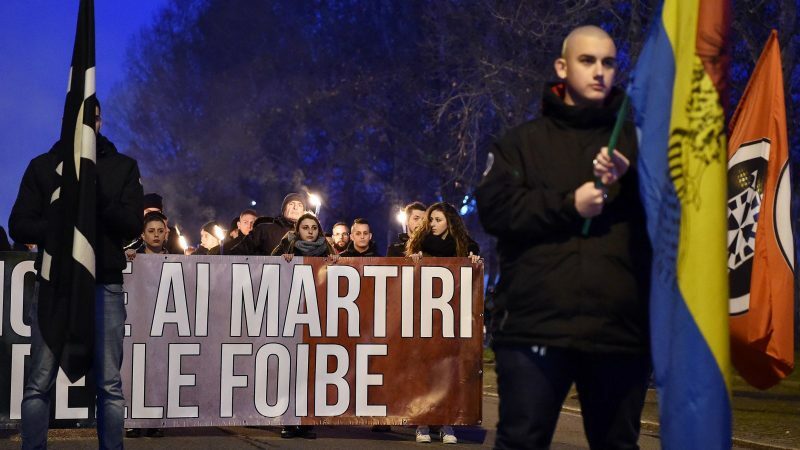 In the decades after the war, Italy’s attempts to turn the page on its Fascist history, and the crimes committed by its own forces in Yugoslavia, meant that the foibe massacres were largely commemorated only by the far-right. It was only in 2004 that the right-wing government of Prime Minister Silvio Berlusconi initiated a national day of remembrance for the massacres.